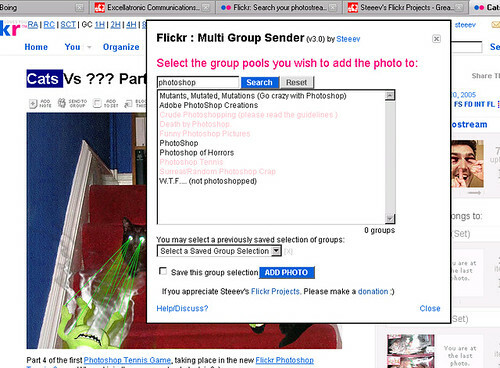 Ive updated my Flickr – Multi Group Sender script to include a search box, that lets you quickly search through your group list to find suitable groups to send your image to. Ive also updated the Flickr PM script to display the users real name and location, if they have listed them, when you pop open the mail sending window, also fixed it to work on the all sizes page and all the search pages. Another script i made an update to was Flickr Inline Forum post editor, it now lets you edit or delete comments below photos without leaving the page you are on. This entry was posted on Saturday, June 7th, 2008 at 6:55 PM	and is filed under firefox, flickr, greasemonkey, programming. You can follow any responses to this entry through the RSS 2.0 feed. Both comments and pings are currently closed.